Well, I haven't posted anything for a month but I was away painting in Paris, Cornwall and busy finishing a commission. I will post it all gradually in the next few weeks. 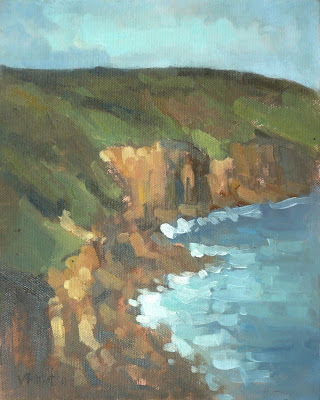 To start with here are 3 paintings from the Cornwall trip. What a great experience! 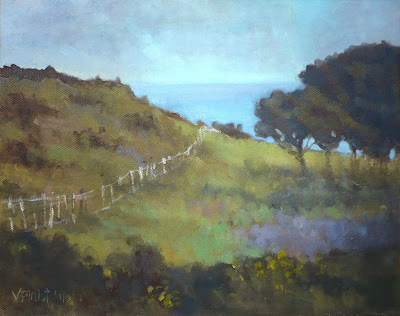 It was organised by the talented Plein Air painter David Pilgrim and also a part of the group were Tim King, Michael Richardson, Roy Connelly, David Bachmann and Anthony Bridge, all very inspiring artists. This one above was actually my last painting, done the morning before I caught my train back home. I think it's my favourite because I had such a good time painting it, probably because I knew I had to go in a few hours. As I was painting this, I really thought "this is the life!" 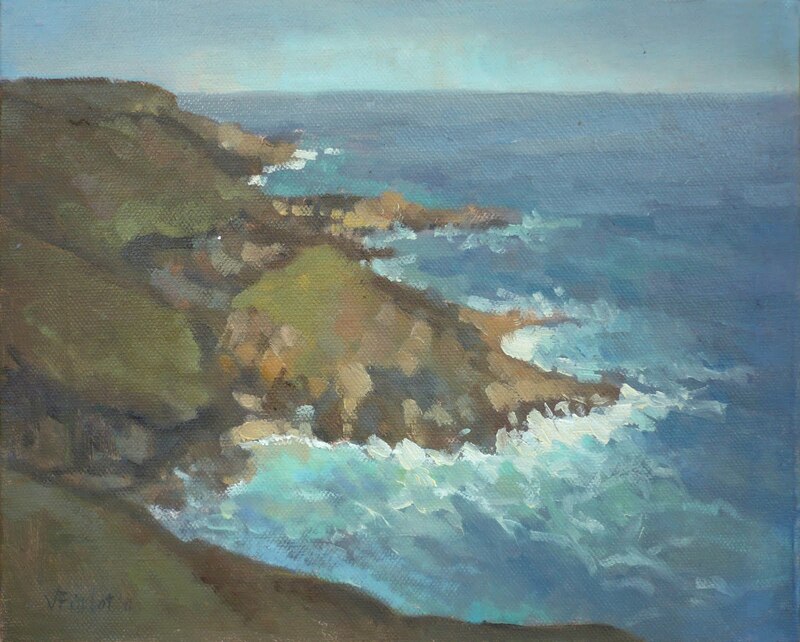 This one below was painted on our way to St Ives. Tim, David and I stopped the car on the roadside to have a look at the beautiful countryside, and before we knew it we were all painting like mad. Nothing better than those unplanned ones! This painting below is an other moment of bliss. It was painted at sunset, the last effort of the day after a pretty long painting day. 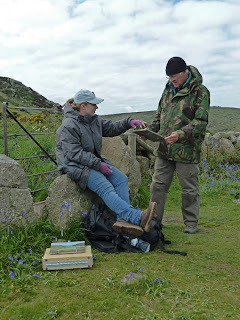 It was also a bit of an effort to get there as it's a steep walk up in the cliff from Sennen beach. But once up there, I suddenly forgot the fatigue and just enjoyed the moment. And for some reasons, I was happy with the painting form start to finish, through every brushstrokes, which has never happened to me before. Here is a picture of the group to finish this post. From left to right: Tim King, myself, David Pilgrim, David Bachmann and Michael Richardson. 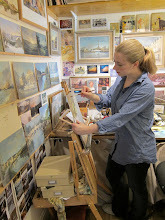 (In case you wonder the lovely painting on the left is David Bachmann's - although I wish I painted this myself!) As you can see I was the only girl in the group but managed to survive! 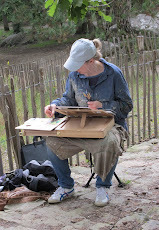 Great post and great paintings Valerie! You've really caught the essence of the subjects without getting distracted by unecessary details. Lovely rich warm glow in the one of Dr Syntax's Head and a real sense of the exposed wilderness at Pendeen. It's such a great spot up there...I always seem to think 'this is the life' when I'm over that way :o) I like the contrast of the more tranquil scene on the road from Zennor too with a dash of those blubells being hinted at. I'm glad we found that spot up there...a much better place to paint than on the touristy harbour front in nearby St Ives! Very atmospheric pics. I admire your soft, fuzzy painting style. Lovely work Valerie. It was a great trip. Thanks David, Ian and Roy. It was a great trip indeed... The first of many more hopefully! It sounds like you had a great time. I like the scenery,our coast in Texas is nothing like that, in fact our water is not usually that pretty of a blue color. I've seen David's blog, do the others have blogs as well. I'm looking forward to seeing the rest of your paintings especially the ones from Paris. It looks like a wonderful time. Very nice work. Glad I found you. Fantastic Work, I really miss not being not this trip! I can't imagine all what I have missed! Thanks Douglas, Susan and Adebanji! More coming soon!